Male crickets rub their wings together to attract female crickets, and the result is the “chirping” noise we hear. Male crickets are equipped with their own built-in fiddle system, and both male and females have their “ears” in their front legs below the knee. Each of the male’s wings has a rough surface on its underside, the file. In the same place on top of each wing is a scraper. The cricket rubs the scraper of either wing against the file of the other to make his music, or his mating call. This cricket music is called stridulation. 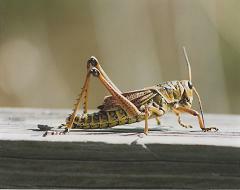 Crickets rest by day and become active at night. The warmer the weather, the more actively a cricket sings. But it won’t sing on nights when the temperature is below 55°. You can’t always follow a cricket’s sound; it can make its noise appear to be coming from somewhere else. For centuries, crickets have been kept as pets. Known as suzumishi in Japan, thousands are distributed in tiny bamboo cages each summer to help people forget the heat. Count the number of cricket chirps in 14 seconds. Add 40. The answer gives the exact temperature in degrees Fahrenheit! Do crickets chirp more slowly as the temperature drops in the fall? How Do I Raise My Own Crickets and What Do Crickets Eat? Why do chipmunks sometimes chirp loudly and continuously for fifteen to twenty minutes at a time?